Add IGF2BP1 monoclonal antibody to my shopping cart. Request a quote for a bulk order for IGF2BP1 monoclonal antibody. Please fill out the form here below. Your local sales account manager will get in touch with you shortly and send you a quotation based on your requirements. Monoclonal antibody raised in mouse against human IGF2BP1 (Insulin Like Growth Factor 2 MRNA Binding Protein 1), using the full length recombinant protein. Human, mouse: positive. Other species: not tested. PBS containing 50% glycerol, does not contain a preservative. Immunoprecipitation was performed on total RNA isolated from 10 million HeLa cells using 15 µg of the Diagenode antibody against IGF2BP1 (cat. No. C15200237) or with an equal amount of mouse IgG2a, used as a negative control. The immunoprecipitated RNA was subsequently analysed on a Bioanalyzer. Figure 1 shows the Bioanalyzer profile obtained with the negative control (upper left) and the IGF2BP1 antibody (upper right). 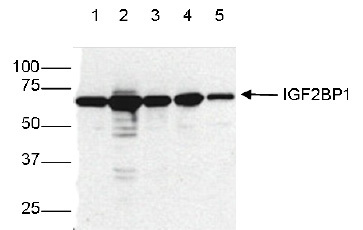 The lower figure shows the gel image for the negative IgG2a control, the IGF2BP1 antibody and the input (lane 1, 2 and 3 respectively). The marker (in bp) is shown on the left, the position of the 28s and 18s ribosomal RNA is indicated on the right. 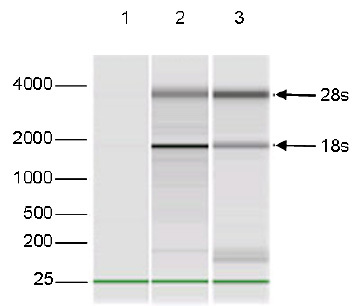 Whole cell extracts from HeLa, 293T, HL-60, NIH3T3 and MEF cells (lanes 1, 2, 3, 4 and 5, respectively) were analysed by Western blot using the Diagenode monoclonal antibody against IGF2BP1 (cat. No. C15200237) diluted 1:1,000 in TBS containing 1% skimmed milk. The position of the protein of interest is indicated on the right; the marker (in kDa) is shown on the left. Immunoprecipitation was performed on whole cell extracts from K562 cells using 5 µg of the Diagenode monoclonal antibody against IGF2BP1 (cat. No. C15200237, lane 2). An equal amount of mouse IgG2a was used as a negative control (lane 1). 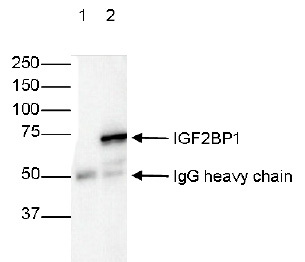 The immunoprecipitated IGF2BP1 protein was subsequently detected by western blot with the IGF2BP1 antibody as described above. Diagenode strongly recommends using this:	IGF2BP1 monoclonal antibody (Diagenode Cat# C15200237 Lot# 001). Click here to copy to clipboard.